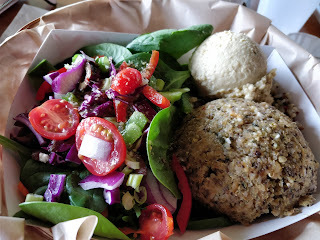 Recently, a friend told me that she had visited a vegetarian restaurant in Watauga, Texas (located near Keller and Ft. Worth, Texas) that offered many vegan, whole-food options. She was ecstatic about the food, so we knew we had to check it out! Since our son and daughter-in-law just happen to live a few minutes from the restaurant, we planned a meal there this past weekend when we went out to visit them. 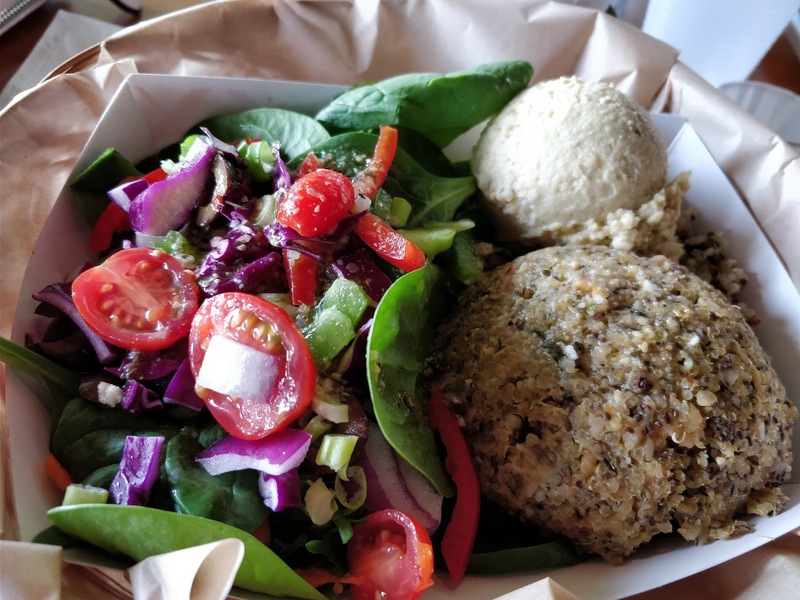 The restaurant, The Healthy Hippie Cafe, has been open about six months. It's a small-ish establishment located on the second floor of a strip center. You have to walk up a flight of stairs to get to there, so keep this in mind if you are bringing elderly or disabled people. It is a bright and cheerful place with plenty of light coming through the windows, comfy pillows to plant behind you if you are sitting on one of the bench seats, and local art donning the walls. The Healthy Hippie Cafe is an order-at-the-register place, with a sizable variety of tasty items to choose from. There is an artsy blackboard with the items and prices listed, or you can order from a paper menu if it's easier on your eyes. The standard menu is available Monday through Saturday, and for Sunday, they have a special breakfast menu that they serve from all day. They also offer homemade whole foods seed, nut, and grain bars and delicious smoothies to pick up if you're in a rush. Also, the staff was friendly, helpful, and extremely knowledgeable about the food they offered. The food came fresh and everyone loved their selections. The owner, Kelli Myatt, is a natural health, fitness, and gardening enthusiast who is passionate about educating others to lead happy, healthy lives. I got a chance to chat with her for a few minutes before we left the restaurant. She was warm and welcoming. In addition, Kelli offers a free pilates class on Sunday mornings (I would call and confirm this before going!) as well as an open-mike night.